Department of Pharmacology, Xuanwu Hospital of Capital Medical University, Key Laboratory for Neurodegenerative Diseases of Ministry of Education, Beijing 100053, China. Objective: The purpose of this study was to investigate the effects and pharmacological mechanisms of icariin, which is the main component in the traditional Chinese herb Epimedium, on β-amyloid (Aβ) production in an amyloid precursor protein (APP) transgenic (Tg) mouse model of Alzheimer's disease (AD). Methods: APPV717I Tg mice were randomly divided into a model group and icariin-treated (30 and 100 μmol/kg per day) groups. Learning-memory abilities were determined by Morris water maze and object recognition tests. Aβ contents were measured by enzyme-linked immunosorbent assays and immunohistochemistry. Amyloid plaques were detected by Congo red staining and Bielschowsky silver staining. The levels of expression of APP and β-site APP-cleaving enzyme 1 (BACE-1) were measured by western blotting and immunohistochemistry. Results: Ten-month-old Tg mice showed obvious learning-memory impairments, and significant increases in Aβ contents, amyloid plaques, and APP and BACE-1 levels in the hippocampus. The intragastric administration of icariin to Tg mice for 6 months (from 4 to 10 months of age) improved the learning-memory abilities and significantly decreased the Aβ contents, amyloid plaques, and APP and BACE-1 levels in the hippocampus. Conclusion: Icariin reduced the Aβ burden and amyloid plaque deposition in the hippocampus of APP transgenic mice by decreasing the APP and BACE-1 levels. These novel findings suggest that icariin may be a promising treatment in patients with AD. Alzheimer's disease (AD) is a neurodegenerative disorder that is characterized by the accumulation of amyloid plaques, the formation of neurofibrillary tangles, and selective neuronal death in the brain . The deposition of β-amyloid (Aβ) is a key pathological event in this disease . It has been identified as a major component of senile plaques in AD brain, and, thus, it is a major target of therapy for AD. Aβ peptides containing 40 or 42 amino acids are produced by the sequential cleavage of amyloid precursor protein (APP) by β-secretase and γ-secretase . β-Site APP-cleaving enzyme-1 (BACE-1, i.e., β-secretase) plays a critical role in Aβ production and amyloidosis in the central nervous system, thus, it has been considered a high-priority therapeutic target [4, 5]. Mutations in human APP around β- or γ-secretase cleavage sites have been shown to be associated with early onset familial AD, which is characterized by increased levels of Aβ1-42 . Consequently, transgenic mice that overexpress human mutant APP at high levels have been widely used in the study of AD pathogenesis or anti-AD drugs. APP transgenic mice, which exhibit neurodegenerative changes in behavioral, biochemical and histopathological aspects that are similar to those observed in patients with AD, are a valuable animal model for AD prevention and treatment studies . In our previous study, APPV717I transgenic mice that overexpressed neuron-specific transgenes with London mutations (V717I) in human APP exhibited deficits in learning and memory with aging, ultrastructural injuries, and decreased protein expression in synapses . Icariin (C33H40O15; molecular weight 676.65) is the major active component extracted from the traditional Chinese herb Epimedium , and has been reported to have various pharmacological effects, such as cardiac protective effects , anti-inflammatory effects , and even anti-tumor properties . According to some studies about the pharmacokinetics of icariin, it was proved that icariin could pass through the blood-brain barrier [13, 14]. A few studies showed that icariin improved learning and memory abilities in aged rats or Aβ25-35 hippocampal injection rats [15, 16], but those models were not the exact AD models. Urano et al. reported that administration of icariin improved spatial memory impairment in transgenic mouse AD model (5xFAD), and attenuated neurite atrophy in an in vitro cell model induced by Aβ1-42 , but they did not detect APP, secretases, Aβ and amyloid plaques in vivo. Therefore, it was not clear whether icariin could influence key proteins and enzymes in the Aβ amyloidogenic pathway in an AD transgenic mouse model. The APPV717I transgenic mice that are bred on a C57/BL6 strain express high levels of human APP751 containing the London (V717I) mutation under the platelet-derived growth factor promoter , which results in a marked increase of Aβ1-42 production . In the present study, we investigated the pharmacological effects and mechanisms of icariin on key steps of Aβ production and deposition in APPV717I transgenic mouse model of AD. This study was approved by Animal Ethics Committee of Xuanwu Hospital of Capital Medical University. Icariin, with a molecular weight of 676.65 (C33H40O15), was obtained from the National Institute for Food and Drug Control (Beijing, China). Powder of icariin (with 99% purity as determined by a high-performance liquid chromatography assay) was dissolved in distilled water and intragastrically administered to mice between 8 and 9 AM every day. In the present study, 3-month-old APPV717I transgenic (Tg) mice were obtained from the Institute of Experimental Animals of the Chinese Academy of Medical Sciences (Beijing, China). The gene mutation in each mouse has been confirmed by polymerase chain reactions of peripheral blood . Animal housing and all experimental procedures followed the requirements of the Provisions and General Recommendations of Chinese Experimental Animal Administration Legislation. Animals were housed under a 12/12-h dark/light cycle and in standard pathogen-free conditions. They had free access to food and water throughout the entire experiment. After 4-week acclimatization to their home cage, 4-month-old APPV717I Tg mice were randomly divided into 3 groups: APP Tg, APP Tg + ICA 30 μmol/kg, and APP Tg + ICA 100 μmol/kg. Each group consisted of 18 mice (half female and half male). The same number of transgenic-negative and non-transgenic C57/BL6 littermates served as Tg(-) controls and normal controls, respectively. The mice in APP Tg + ICA groups received daily gavages of dissolved icariin (0.1 mL/10 g weight) and all mice in other groups were intragastrically administered an equal volume of distilled water once a day for 6 months beginning at 4 months of age. This MWM consisted of 4 days of learning-memory training and a probe trial that was applied on day 5. The animals were trained in a circular pool (120 cm in diameter) that was located in a lit room with visual cues. An escape platform (9.5 cm in diameter) was submerged 1.0 cm below the surface of the pool water, which was maintained at 23 ± 2°C and mixed with milk powder in order to obscure the platform. The location of the platform remained in the center of the northwest quadrant throughout the 4-day training period. On each day, mice were trained in 1 morning and afternoon block. Each block consisted of 2 trials, and each trial lasted for 120 s or ended as soon as the mice reached the submerged platform, thus escaping from the water maze. Before the first trail, each mouse was put on the platform for 15 s, which was followed by a 60-s free swim, and the mouse was then assisted to the platform where it remained for another 15 s of rest. Then, the test began: the mouse was released into the water facing the pool wall, turning north, south, east, and west for each trial. Whether a mouse found or failed to find the platform within 120 s, it was placed on the platform for 15 s. Data on the escape latencies from the water maze, which was defined as finding the submerged escape platform, and the distances that the mice had traveled were collected, and the swimming speed of each mouse in every single trial was calculated. The probe trial was formed by removing the platform and allowing each mouse to swim freely for 60 s inside the pool. The swimming time and distance traveled by each mouse in the target quadrant when the platform had been removed were recorded by a computerized video system. The ratio of time and distance in the quadrant to those in the whole pool were calculated and compared among the groups. The observation arena, with a size of 45 cm × 35 cm × 20 cm, was made up of white plastic and was located in a testing room that was dimly lit by constant illumination at about 40 lx in the testing arena. The objects chosen were 3 identical cuboid blue plastic blocks (A; 4.5 cm × 4.5 cm × 5 cm) and a white cylindrical plastic bottle (B; height: 7 cm; diameter: 4 cm) that was filled with water. These objects were heavy enough to prevent the mice from moving them. According to our screening test, these 2 kinds of objects elicited roughly the same exploratory time relative to the other. Two identical sets of arenas and objects were used by 2 observers who conducted the tests independently in the same room but who were hidden from each other. Each person randomly tested half of the mice in each group. The test lasted for 3 days. On day 1, the mice were placed in the arena for 10 min in order to reduce neophobic responses and habituate the animals to the stimuli that were presented in the empty arena. On day 2, 2 identical objects (A1A2 or B1B2) were placed at opposite sides in each arena 8 cm from the walls and with 29 cm between them. The mice were placed in the middle of the space between the objects in order to start a 10-min period of object learning and training. On day 3, 1 familiar (previously observed) object and 1 new object were placed in the arena (A3B or B3A for each arena), and the mice were placed in the middle of the space between the objects to start a 10-min object recognition test. Object exploration was defined as the exhibition of the orientation in which the animal's snout was moved towards the object and the mouse was located within 2 cm or less of the object. Incidents of the mouse running around the object or sitting on it were not recorded as an exploratory behavior. Objects were washed with ethanol after each individual trial in order to equate olfactory cues. The time spent exploring the familiar object and the new object during days 2 and 3 was observed visually and timed with stopwatches. The objects' positions (at the sides of the arena) were alternated for each animal in order to reduce errors in our collected data. The times when the mice exhibited exploratory behaviors were recorded and used to calculate a memory discrimination index (DI), as previously reported . DI = (N - F)/(N + F), where N is the time spent exploring the new object and F is the time spent exploring the familiar object. Higher DI was considered a reflection of greater memory ability. For the western blotting assay, we used anti-APP, anti-BACE-1, and anti-PS-1 antibodies from Sigma-Aldrich Co. LLC (St. Louis, MO, USA). The hippocampi from 5 individual mice in each group were homogenized in iced buffer containing 50 mM Tris-HCl (pH 7.5), 1 mM ethylenediaminetetraacetic acid, 0.5 mM ethylene glycol tetraacetic acid, 150 mM NaCl, and 1% protease inhibitor cocktail (Sigma-Aldrich Co. LLC). A western blot analysis was performed as described previously . Proteins were separated by sodium dodecyl sulfate (SDS)-polyacrylamide gel electrophoresis, blotted onto a polyvinylidene fluoride membrane, and reacted with the primary antibody. A horseradish peroxidase-conjugated goat-anti-mouse IgG (1:5,000) was used as a secondary antibody. Immunoreactive bands were visualized by enhanced chemiluminescence (ECL system; Santa Cruz Biotechnology, Inc., Santa Cruz, CA, USA) and exposed to x-ray film (Kodak, Rochester, NY, USA). For the immunohistochemical staining, we used anti-Aβ, anti-APP, anti-BACE-1, and anti-PS-1 monoclonal antibodies (Sigma-Aldrich Co. LLC). Five mice in each group were sacrificed and immediately perfused through the heart with 0.9% NaCl, which was followed by 4% paraformaldehyde in 0.1 M phosphate buffer for 10 min. Brains were postfixed by immersion for 4 days and then cryoprotected in 20% sucrose. Brains were rapidly frozen in OCT embedding medium, and frozen sections with a thickness of 20 μm were taken through the hippocampus and processed in free-floating conditions. Immunohistochemical procedures for light microscopic examinations were performed as described previously  with slight modifications. Sections were treated with 0.1 M phosphate-buffered saline containing 0.3% Triton X-100 (PBST) for 4 days and first incubated with the primary antibody overnight at 4°C. The sections were then incubated with the second biotinylated goat anti-mouse IgG antibody (1:1,000) at room temperature for 2 h and finally with horseradish-conjugated streptavidin (1:1,000) at room temperature for 1 h. Peroxidase activity was revealed by 0.02% 3,3′-diaminobenzidine in 0.05 M Tris-HCl buffer, pH 7.6, containing 0.005% H2O2 and 0.3% nickel ammonium sulfate. The stained sections were mounted on glass slides, dehydrated, cleared, and coverslipped. The quantitative analysis of the Aβ burden was expressed as the percent area of Aβ deposits in the whole brain tissue area that was examined. Three slides from each mouse were rehydrated in graded alcohols, immersed in Hematoxylin for 2 min, and then dipped in hydrochloric alcohol for 10 s. Firstly, sections were rinsed in running tap water until it turned blue and distilled water 2 times. Then, sections were Congo red stained for 40 min at room temperature before being rinsed in running water; they were then dipped in lithium carbonate for 5 s and washed in running tap water. Alcohol (80%) was used to differentiate the nonspecific background staining, and the sections were then rinsed in running tap water for 10 min, cleared in xylene, and covered with neutral gum. Three slides from each mouse were rehydrated in graded alcohols before being rinsed in distilled water 3 times. They were then immersed in 2-4% argent nitrate solution for 25-35 min at 37°C in the dark. The slides were washed in distilled water 3 times after the argent nitrate solution was removed. The staining was deoxidized with 10% formaldehyde until the slide changed to a pale-yellow color. The slides were rinsed in distilled water 3 times, and the excess water was removed. Ammoniacal silver solution (200 µL) was added to each slide for 5 min. The excess solution was removed, and the slides were dipped in 8% formalin for 2 min. Slides were rotated several times until the yellow dye remained stable. The sections were fixed in 5% sodium thiosulfate for 5 min. Slides were dried in the open air, cleared in xylene, and then coverslipped for the microscopic examinations. With highly specific antibodies and a sensitive sandwich ELISA, we quantified Aβ1-42 in brain homogenate fractions that were extracted with TBS (50 mM Tris-HCl, pH 7.6, 150 mM NaCl) or 2% SDS and 70% formic acid, respectively, as described previously. Frozen hippocampal samples were homogenized with a homogenizer in 1 mL of TBS/complete protease inhibitor plus 20 µg/mL pepstatin A (Roche Diagnostics GmbH, Mannheim, Germany) and then centrifuged at 100,000 × g for 1 h at 4°C with an Optima TLX ultracentrifuge (Beckman Coulter, Inc., Brea, CA, USA). The TBS supernatants were stored at -80°C, and the pellets were homogenized in 1 mL of 2% SDS/TBS with protease inhibitor (Roche Diagnostics GmbH). They were then centrifuged at 100,000 × g for 1 h at 25°C following incubation for 15 min at 37°C. The pellets, which corresponded to the insoluble fraction, were washed once and then extracted further with 1 mL of 70% formic acid. They were then centrifuged at 100,000 × g for 1 h. The supernatants of insoluble 70% formic acid extracts were neutralized with 1 M Tris-HCl (pH 8.0) at a dilution of 1:20. For quantification of Aβ1-42, we used an specific ELISA Kit (#27711, recognizing human Aβ1-42 and the cross reactivity with mouse Aβ1-42 was 70.9%, Immuno-Biological Laboratories Co., Ltd., Gunma, Japan) according to the manufacturer's instructions. All data were expressed as mean ± standard deviation (SD). The differences among the groups were analyzed with one-way analysis of variance (ANOVA) followed by the Post-hoc Duncan multiple group comparison. P values less than 0.05 were considered statistically significant. In the present study, the Morris water maze was used to examine the spatial learning and memory performances of mice. Escape latency in first training trial among groups varied from 89.94 s to 97.18 s, indicating no significant difference among groups. “Escape latency” in Figure 1 is the data in the last trial after 4 day's training. Both the 4- and 10-month-old Tg(+) mice showed significantly prolonged escape latencies compared with the age-matched transgenic-negative [Tg(-)] control group (P<0.05, P<0.01). The escape latencies of 10-month-old Tg(+) mice were significantly longer than those of 4-month-old Tg(+) mice (P<0.01), while no significant differences were found between the normal control group and the age-matched Tg(-) group (Fig. 1A). However, the 10-month-old Tg(+) mice that had been intragastrically treated with icariin (100 μmol/kg) for 6 months beginning at 4 months of age showed significantly shorter escape latencies than vehicle-treated 10-month-old Tg(+) mice (P<0.01; Fig. 1B). In the probe trials of the Morris water maze, mice were allowed to search the platform for 60 s in an empty maze. Fig. 1C illustrates group differences of the mean percentage searching time in the target quadrant compared to the whole pool during the probe trial. Compared with age-matched Tg(-) group, Tg(+) mice at both 4 months and 10 months of age showed a significant less time in the target quadrant (P<0.05, P<0.01). The time in the target quadrant showed a significantly decrease in 10-month-old Tg(+) mice compared with those in 4-month-old Tg(+) mice (P<0.05), while no significant differences were found between the normal control group and the age-matched Tg(-) group (Fig. 1C). The 10-month-old Tg(+) mice that had been treated with icariin (100 μmol/kg) for 6 months beginning at 4 months of age showed significantly longer time in the target quadrant than vehicle-treated 10-month-old Tg(+) mice (P<0.01; Fig. 1D). In the object recognition test (ORT), there was no significant difference in the exploration time to 2 identical objects on day 2 among groups (data not shown). On day 3, 10-month-old Tg(+) mice showed a significant decrease in the memory discrimination index (DI) compared with both age-matched Tg(-) mice (P<0.05) and 4-month-old Tg(+) mice (P<0.01; Fig. 2A). The DI was significantly increased in mice that were treated with icariin (100 μmol/kg) for 6 months compared with the Tg(+) model mice (P<0.05), suggesting an improvement in object recognition memory by icariin treatment (Fig. 2B). There was no significant difference in total exploration time (N+F) that was observed among groups. These results provided evidence that icariin ameliorated the learning and memory deficits of Tg(+) mice. Effects of icariin on learning and memory impairments in APP V717I transgenic mice (Morris water maze). Icariin (ICA) at the doses of 30 μmol/kg (L) and 100 μmol/kg (H) was intragastrically administered to APP Tg mice for 6 months (from 4 to 10 months of age). “Escape latency” is the data in the last trial after 4 day's training. A. Comparison of escape latencies in different mice groups at 4 months of age and 10 months of age. B. Effects of icariin on escape latencies in 10-month-old APP transgenic (Tg) mice. C. Group differences of the mean percentage searching time in the target quadrant compared to the whole pool during the probe trial. D. Effects of icariin on the time in the target quadrant. n=18. The data are shown as mean ± standard deviation (SD); ▲P<0.05, ▲▲P<0.01, compared with transgenic-negative [Tg(-)] mice; △△P<0.01, compared with 4-month-old APP Tg mice; **P<0.01, compared with APP Tg(+) model mice. Effects of icariin on learning and memory impairments in APP V717I transgenic mice (object recognition test, ORT). Icariin (ICA) at the doses of 30 μmol/kg (L) and 100 μmol/kg (H) was intragastrically administered to APP Tg mice for 6 months (from 4 to 10 months of age). A. Comparison of the discrimination index (DI) in different mice groups at 4 months of age and 10 months of age. B. Effects of icariin on DI in 10-month-old APP Tg mice. On day 2, there was no significant difference in the exploration time to 2 identical objects among groups. On day 3, there was no significant difference in total exploration time (N+F) among groups. n=18. The data are shown as mean ± SD; ▲P<0.05, compared with Tg(-) mice; △△P<0.01, compared with 4-month-old APP Tg mice; *P<0.05, compared with APP Tg(+) model mice. Effects of icariin on Aβ contents in the hippocampus of 10-month-old APP V717I transgenic mice. Icariin (ICA) at the doses of 30 μmol/kg (L) and 100 μmol/kg (H) was intragastrically administered to APP Tg mice for 6 months (from 4 to 10 months of age). A. Aβ burden in the hippocampal CA1 region that was detected with immunohistochemical staining by using anti-Aβ1-16 antibody (scale bar = 50 μm). n=5. B. Aβ1-42 contents in the whole hippocampus that were measured with enzyme-linked immunosorbent assays. n=8-10. The data are shown as mean ± SD; ▲▲ P < 0.01, compared with Tg(-) mice; ** P < 0.01, compared with Tg(+) model mice. The immunohistochemical staining with the anti-Aβ1-16 was used to evaluate the total Aβ burden in mouse brain. The number of Aβ-positive cells was significantly increased in the hippocampal CA1 region of Tg(+) mice at the age of 10 months compared with that in the age-matched Tg(-) control group. 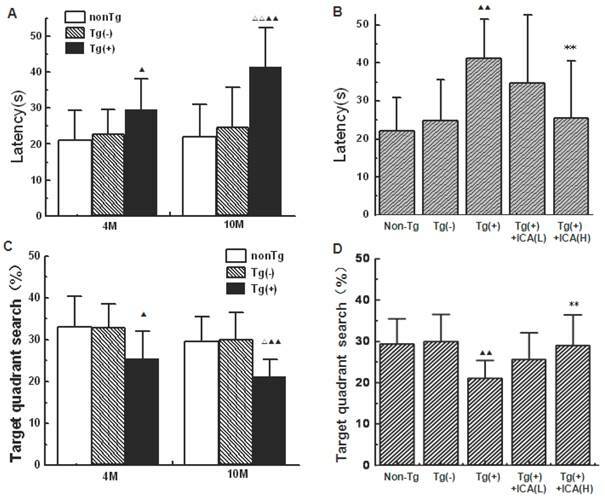 Tg(+) mice that were treated with 100 μmol/kg icariin showed an obvious decrease in the number of Aβ-positive cells compared with that in the Tg(+) model mice (Fig. 3A). Since anti-Aβ1-16 antibody cannot distinguish between Aβ1-40 and Aβ1-42, and Aβ1-42 is more cytotoxic and more likely to aggregate to form plaques than Aβ1-40, we further examined Aβ1-42 with ELISA. As a result, the levels of Aβ1-42 were found to be significantly increased in the hippocampus of Tg(+) mice at the age of 10 months compared to the age-matched Tg(-) control group (P<0.01). These increased levels were decreased by treatment with 30 and 100 μmol/kg icariin for 6 months (from 4 to 10 months of age) compared to those in the Tg(+) model mice (P<0.01) (Fig. 3B). Congo red was used to stain the amyloid plaques in the brains of mice, and the positively stained areas were measured with an image analysis system in order to determine the quantity of amyloid plaques. The results showed that amyloid plaques were scattered in the molecular/polymorphic layer of the hippocampus, and rare amyloid plaques were distributed in the pyramidal cell layer. The amyloid plaques exhibited a light red dispersion without distinct boundaries, and plaque staining was denser in the hippocampus of Tg(+) mice (Fig. 4A). The molecular layer in the hippocampi of 10-month-old Tg(+) mice had a larger percentage of areas that were positive for amyloid plaques than the age-matched Tg(-) control group (P < 0.01). After icariin (30 and 100 μmol/kg) administration for 6 months, the plaque staining was lighter, and the positively stained areas of amyloid plaques were significantly reduced (P < 0.01) (Fig. 4B). The results from the Bielschowsky silver staining also showed that amyloid plaques were mainly scattered in the hippocampal molecular layer, and these results were consistent with the results from the Congo red staining. Mature amyloid plaques exhibited round, oval, or irregular shapes, deeply dyed cores, and shallow surrounding halos at high magnification. Diffuse plaques appeared as loose reticular spheres with light coloring and without a deeply dyed and dense core. The number of amyloid plaques was increased in the hippocampal molecular layer, and dominantly mature amyloid plaques were dense and deeply dyed in Tg(+) mice at the age of 10 months, while age-matched Tg(-) mice exhibited no plaques in the hippocampus. 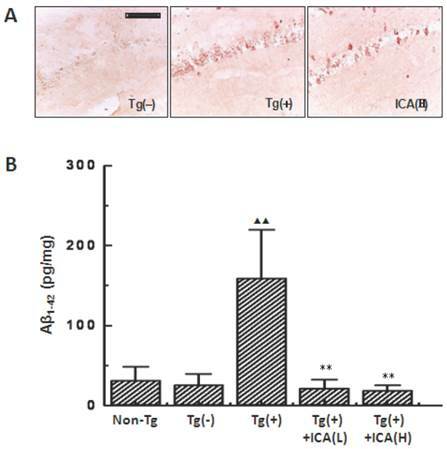 The amyloid plaques in these brain regions in 30 and 100 μmol/kg icariin-treated Tg(+) mice appeared diffusely and lightly stained, and the number of plaques was reduced compared with that in the age-matched Tg(+) model group (Fig. 4C). Effects of icariin on amyloid plaques in the hippocampus of 10-month-old APP V717I transgenic mice. Icariin (ICA) at the doses of 30 μmol/kg (L) and 100 μmol/kg (H) was intragastrically administered to APP Tg mice for 6 months (from 4 to 10 months of age). A. Congo red staining. B. Semiquantitative analysis of Congo red staining. C. Bielschowsky silver staining. n=5. The data are shown as mean ± SD; ▲▲P<0.01, compared with Tg(-) mice; **P<0.01, compared with APP Tg(+) model mice. Scale bar = 50 μm. The levels of APP that were detected by western blot were significantly increased in the Tg(+) mice compared with those in the age-matched Tg(-) control group (P<0.05). After icariin administration at doses of 30 and 100 μmol/kg for 6 months, the levels of APP expression were obviously reduced compared with those in the Tg(+) model group (P<0.05, P<0.01) (Fig. 5A and B). The 6-month treatment of 100 μmol/kg icariin did not show the significant change in APP expression in normal C57/BL6 mice (data not shown). APP expression was also observed in hippocampal CA1 areas with immunohistochemical staining. The N-terminal of APP-positive markers presented as brown granules, which were mainly distributed in the hippocampal neuronal cytoplasm when observed under the light microscope. Compared with the Tg(-) control group, APP-positive cells were significantly increased with deep staining in the cytoplasm in the hippocampal CA1 areas of 10-month-old Tg(+) mice. The 100 μmol/kg icariin-treated group showed less APP-positive cells in the hippocampal CA1 regions compared with those in Tg(+) model mice (Fig. 5C). Effects of icariin on amyloid precursor protein (APP) expression in the hippocampus of 10-month-old APP V717I transgenic mice. Icariin (ICA) at the doses of 30 μmol/kg (L) and 100 μmol/kg (H) was intragastrically administered to APP Tg mice for 6 months (from 4 to 10 months of age). A. Western blot. B. Semiquantitative analysis of western blot. C. Immunohistochemical staining (scale bar = 50 μm). n=5. The data are shown as mean ± SD; ▲P<0.05, compared with Tg(-) mice; *P<0.05, **P<0.01, compared with Tg(+) model mice. The levels of expression of BACE-1 (β-secretase) in the hippocampus of 10-month-old mice were detected by western blotting. The results indicated significantly higher levels of expression of BACE-1 in Tg(+) mice compared with those in the Tg(-) control group (P < 0.01). The high levels of BACE-1 expression in Tg(+) mice were significantly reduced by icariin administration at a dose of 100 μmol/kg for 6 months (P < 0.05) (Fig. 6A and B). BACE-1 expression was also observed in the mouse hippocampal CA1 area with immunohistochemical staining. Brown granules, which represented positive BACE-1 immunohistochemical staining, were seen in the neuronal cytoplasm with light microscopy. 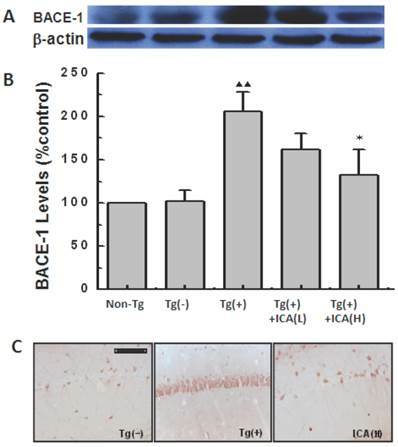 Compared to the Tg(-) control group, BACE-1-positive cells were significantly increased and they exhibited dense staining in the cytoplasm in hippocampal CA1 in 10-month-old Tg(+) mice. The 100 μmol/kg icariin-treated Tg(+) group had less BACE-1-positive cells in the hippocampal CA1 region compared with that in the Tg(+) model group (Fig. 6C). Effects of icariin on β-site APP-cleaving enzyme 1 (BACE-1) expression in the hippocampus of 10-month-old APP V717I transgenic mice. Icariin (ICA) at the doses of 30 μmol/kg (L) and 100 μmol/kg (H) was intragastrically administered to APP Tg mice for 6 months (from 4 to 10 months of age). A. Western blot. B. Semiquantitative analysis of western blot. C. Immunohistochemical staining (scale bar = 50 μm). n=5. The data are shown as mean ± SD; ▲▲P<0.01, compared with Tg(-) mice; *P<0.05, compared with Tg(+) model mice. Transgenic mouse models with mutant APP have been widely used both for investigating the mechanisms of AD and for evaluating the effects of drugs. APP V717I (valine changed into isoleucine)-mutant mice that over-express human APP with a mutant in amino acid 717 have been reported to be a highly valuable model of amyloid pathology . In the present study, we confirmed that APPV717I transgenic mice exhibited impairments in learning-memory abilities as early as 4 months, and these were exacerbated in 10-month-old Tg mice. The intragastric administration of icariin for 6 months significantly shortened the escape latencies in the Morris water maze test and obviously increased the discrimination index in the object recognition test in Tg(+) mice at the age of 10 months. Icariin improved the learning-memory deficits in the AD animal model, suggesting that icariin may have the potential to treat AD patients and ameliorate their cognitive impairment symptoms. Amyloid plaques are one of the characteristic pathologic hallmarks of AD, and the deposition of Aβ is the main cause of plaque production. In order to examine the beneficial effects of icariin therapy in AD, we investigated the amyloid plaques and Aβ burden in the brain of APP Tg mice. The results exhibited a significant increase in amyloid plaques and Aβ burden in the hippocampus of 10-month-old APP Tg(+) mice, which was consistent with other reports [23, 24]. Administration of icariin to the Tg(+) mice obviously decreased amyloid plaques and Aβ burden. Since Aβ1-42 is more cytotoxic and more likely to aggregate to form plaques than Aβ1-40 , we further examined Aβ1-42 with ELISA in our study. At the age of 10 months, the levels of Aβ1-42 in the hippocampus were significantly higher in Tg(+) mice than those in Tg(-) control mice. There were no significant differences between APP Tg(-) mice and non-Tg normal mice in the overall data of the entire study. Therefore, it could be inferred that the transgenic operation did not affect the results. Icariin-treated Tg(+) mice showed a significant reduction in the contents of Aβ1-42 in the hippocampus compared with those in age-matched Tg(+) mice. The treatment of icariin could reduce Aβ1-42 in Tg(+) mice close to Tg(-) mice Aβ1-42 levels, whereas, the levels of amyloid staining in high-dose treated Tg(+) mice in the immunohistochemistry (IHC) slices were higher than that in Tg(-) mice. This may be because anti-Aβ1-16 monoclonal antibody which we used in IHC staining cannot distinguish between Aβ1-40 and Aβ1-42, thus the result in IHC staining may represent the total Aβ burden. These results suggest that icariin may mainly reduce Aβ1-42 rather than Aβ1-40. 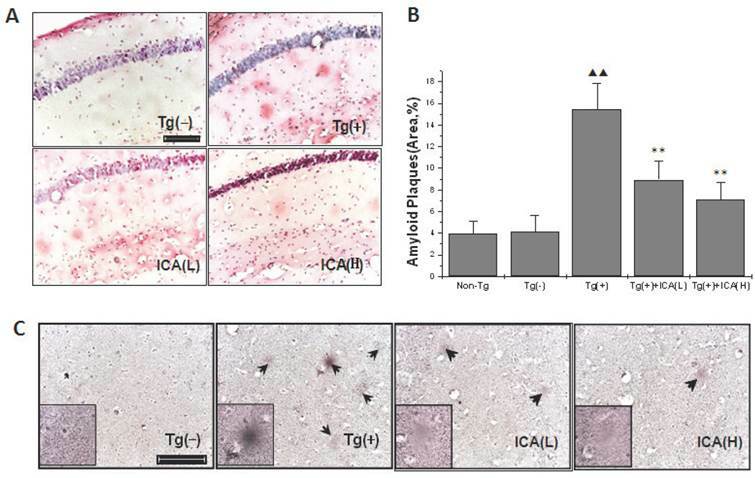 A down-regulation of Aβ1-42 would be an important beneficial effect of icariin as it would inhibit the formation of amyloid plaques and therefore improve the cognitive impairments in APP Tg(+) mice. Aβ is generated from APP through sequential cleavage by β- and γ-secretase. β-Secretase (β-site amyloid precursor protein-cleaving enzyme 1, BACE-1) cleaves the ectodomain of APP and generates an APP C-terminal fragment. Then, γ-secretase cleaves the transmembrane domain and releases Aβ peptides (Aβ1-40 or Aβ1-42) . Thus, APP, BACE-1, and γ-secretase are all related to Aβ production. In order to elucidate the pharmacological mechanisms by which icariin decreased Aβ content, we examined the expression of these key proteins and enzymes in Tg mice. As the initiation of Aβ generation, APP is the primary target in the pathological mechanisms in Tg mouse. In 2- or 4-month-old APPV717I Tg mouse, human APP protein is expressed more than 2-times the endogenic APP level . In the present study, the western blotting and immunohistochemical results showed a tendency for increased APP expression at 4 months of age in the hippocampus of Tg mice (data not shown). At the age of 10 months, the expression of APP was significantly increased in the hippocampus of Tg mice. APP levels in the hippocampus at the age of 10 months were obviously higher than those at the age of 4 months, which was consistent with other reports . This indicated that the increased expression of APP which was observed with aging might have been due to the initiation of AD pathology in APP Tg mice. In the present study, we found that 6 months of icariin treatment reduced the level of APP expression in the hippocampus of APP V717I Tg mice at the age of 10 months. Since APP is the precursor protein of Aβ, excessive APP may increase Aβ production. 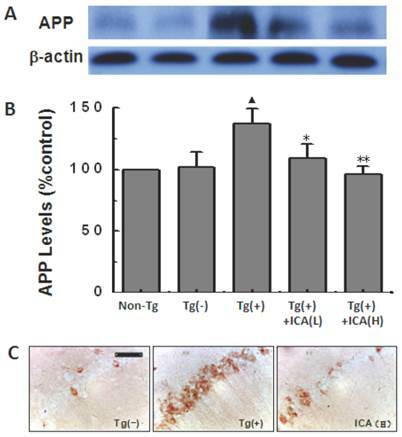 The inhibitory effect of icariin on the excessive APP expression may be one of the mechanisms by which icariin treatment decreases the Aβ content in the brain of APP Tg mice. The mechanism of icariin to inhibit the over-expression of APP is not clear. Similar with our result of icariin, cerebrolysin treatment significantly reduced the levels of Full-length APP in APP Tg mice . NeuroAiD®, also known as MLC601, obviously decreased full-length APP levels in APP transfected SH-SY5Y cells . In these reports, the authors did not explain the underlying mechanism of altered APP levels. Full-length APP has been implicated in several neuronal functions such as cell adhesion, neuronal differentiation, neuronal migration, neurite outgrowth and synapse formation . In our present study, there was no significant change of full-length APP in the brain of normal C57/BL6 mice with 6-month treatment of 100 μmol/kg icariin (data not shown). Some studies in other laboratories also proved that there was no significant alteration of neuron morphology and Aβ1-40 staining in the brain after 3-month treatment of icariin to normal or sham control rats [30, 31]. The transmembrane protein BACE-1 (β-site APP-cleaving enzyme 1) is the main β-secretase that is involved in the Aβ-generating process. Previous studies reported an upregulation of neuronal BACE-1 levels in the brains of 3-month-old APPV717I transgenic mice , and BACE-1 expression in frontal cortices with Aβ deposition was 3 times as much as in the cerebellum without Aβ burden . In order to determine the pharmacological target of icariin, the levels of expression of BACE-1 in the brain of APP Tg mice were measured in the present study. BACE-1 expression in the hippocampus showed a mild increase in APPV717I mice at 4 months of age (data not shown) and a significant increase at the age of 10 months. Our research revealed that BACE-1 levels increased mildly in early periods of hippocampal disorders, but they were severely increased later with aging. This increasing tendency of BACE-1 was consistent with the change in APP. This may contribute to the high levels of Aβ in the brains of APP Tg mice. Icariin administration for 6 months significantly reduced the levels of BACE-1 expression in the hippocampus of APP V717I Tg mice at the age of 10 months. Inhibition of BACE-1 expression would be a novel target for icariin in AD treatment. The Aβ burden is related to both the excessive BACE-1 expression and the enhanced BACE-1 activity. In the present study, the activity of BACE-1 was not detected. However, in our previous study, we found that Epimedium flavonoids (>50% of which is icariin) decreased Aβ production in APP cDNA-transfected SH-SY5Y neuroblastoma cells and inhibited β-secretase activity in vitro . Since icariin accounts for >50% of Epimedium flavonoids, there is the possibility that icariin can also inhibit BACE-1 activity, but this needs to be proved in the future study. Besides BACE-1, the other key enzyme involved in the generation of Aβ is γ-secretase, which is considered to have at least 4 integral membrane proteins, such as presenilin 1 (PS-1), nicastrin, APH1, and PEN2. Among them, PS-1 is the most important component in γ-secretase . In our present study, PS-1 did not show obvious changes in the brains of APPV717I Tg mice at the age of 10 months, and icariin had no significant effects on PS-1 levels in the hippocampus of APP Tg mice after its administration for 6 months (data not shown). The present study demonstrated that icariin reduced Aβ contents and its deposition and decreased amyloid plaques in the hippocampus of APPV717I transgenic mice by decreasing the expression of APP and BACE-1, thus improved learning-memory abilities. These novel findings suggest that icariin may have the potential to block or retard the pathological progression of AD. As an effective component of traditional Chinese medicine, icariin is promising for the prevention and treatment of AD. This work was supported by the National Natural Science Foundation of China (Nos. 81274120, 81273498), the Beijing Natural Science Foundation (No. 7112061), the Beijing Key Foundation of Traditional Chinese Medicine (No. KJTS2011-04), the Capital Health Development Scientific Grant (No. 2011-1001-05), and the Beijing Health and Technical Personal of High-level Plan (Nos. 2009-3-66, 2011-1-7). We would like to thank Li Zhang and Hou-xi Ai for technical assistance. AD, Alzheimer's disease; APP, amyloid precursor protein; Aβ, β-amyloid; BACE, β-site APP-cleaving enzyme; Tg, APPV717I transgenic.